In 2015 KAUMC became one of the six churches that make up the Hilliard Adopt A House affiliate of Habitat for Humanity Mid Ohio (HfHMO). In the three years that we have been active so far our fellow parishioners have become an integral part of the group! Our Hilliard Adopt A House affiliate typically works every Wednesday and Saturday on our houses, and our King Avenue team really shines during the Wednesday work sessions that typically have lower attendances. In 2017 twenty members of King Ave. UMC put in 665 hours on the house, which is the equivalent of over four months of a full time job! Overall, the new house that we are working on in the Linden area of Columbus has taken over 3,600 hours of labor to manage and construct so far. Hilliard Adopt A House (HAAH) was formed in 1996 and so far has built 12 new homes and has rehabilitated 11 additional homes, all in Central Ohio. Some of the home rehabilitations have been houses that were originally built by Habitat for Humanity many years ago. When life situations force the Habitat families to vacate their houses (family deaths, loss of jobs, etc.) HfHMO, who holds the unpaid titles to the homes, often needs to bring the houses up to current building codes in addition to installing modern appliances and energy saving features. Other houses that are rehabilitated are abandoned properties that have been taken over by the local municipality and given to HfHMO to make habitable once again. This year’s home is being constructed for Monika Bryant and her two teenage daughters. As required, Monika has put in 100 hours of ‘sweat equity’ on her house in addition to taking finance and home maintenance classes through HfHMO. In a few short weeks we will be having a home dedication ceremony where Monika will get the keys to her new home and begin making modest mortgage payments. This “hand up” from our group is sure to have a lasting impact on the Bryant family’s lives! In addition to supplying the labor to build or rehabilitate homes for deserving families, our Habitat affiliate is responsible for raising a significant portion of the over $55,000 that it takes build a new home, or a lesser amount for the home rehabs. This past year Habitat paired our group with an Anheuser-Busch employee group and an Alliance Data employee group to come up with the full amount of money that was needed. 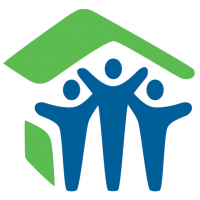 After taking several months off, our Adopt A House group will be paired with yet another Central Ohio family who will choose a location and a floor plan for their new home and we will be off and running once again! On behalf of Hilliard Adopt A House and the twenty folks from King Avenue UMC who worked on this year’s house, we want thank you for taking an interest in our work and we hope that you will support this important mission with your financial support. And hopefully we’ll see you out at a future jobsite to lend a helping hand! For more information on how to start volunteering your time and learning new building and maintenance skills, please contact Trena Brown at trenamo@columbus.rr.com or Larry Ziniel at larry_ziniel@yahoo.com or 614-282-8371.